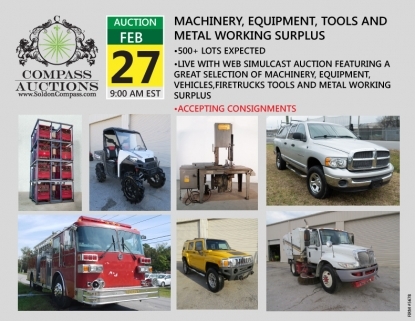 Compass Auctions will host an LIVE with SIMULCAST auction event on February 27, 2019. This auction will have a 9am EST start time and will offer 500+ lots of quality surplus assets of Machinery, Equipment, Tools and Metal Working Supply! Don’t miss the chance to consign your items for this auction and have your items nationally marketed to an eager to buy audience. For additional photos, catalog of items, terms & conditions of the auction and to REGISTER to bid, visit the online catalog.